BAGHDAD - Fierce clashes erupted Tuesday between Iraqi special forces and al Qaeda-linked militants outside the city of Fallujah, a flare-up in a days-long standoff in the Sunni-dominated western province of Anbar, Iraqi officials said. The fighting broke out about 12 miles west of Fallujah, following the capture of an army officer and four soldiers in the area a day earlier, Anbar provincial spokesman Dhari al-Rishawi told The Associated Press. There was no immediate word on casualties. The clashes began just hours after deadly bomb attacks killed at least four people elsewhere in the country. Iraqi troops are massing around Fallujah Tuesday as they prepare to retake the strategic western city from militants, reports CBS News correspondent Elizabeth Palmer. Iraqi security forces and allies from Sunni tribes have been battling militants to recapture two key cities in Iraq's western Anbar province, Fallujah and Ramadi, the provincial capital. Fighters from an al Qaeda-linked group, known as the Islamic State in Iraq and the Levant, control the center of Fallujah, 40 miles west of Baghdad, and part of the nearby Ramadi. The al Qaeda fighters' seizure of the two cities - once bloody battlegrounds for U.S. troops - poses the most serious challenge to Prime Minister Nouri al-Maliki's Shiite-led government since the departure of American forces in late 2011. The worsening security situation prompted Vice President Biden to call Iraq's prime minister in a show of support. Biden and Nuri al Maliki discussed the partnership between the two countries, but the U.S. has made clear that it sees the instability in Anbar as Iraq's fight, and American soldiers will not be sent back to help. The immediate trigger for the unrest was the Dec. 28 arrest of a Sunni lawmaker sought on terrorism charges, followed by the government's dismantling of a months-old anti-government Sunni protest camp in Ramadi. Sectarian tensions in Iraq have been rising for much longer. Violence spiked after the government staged a deadly crackdown on a Sunni protest camp last April. Militants have also targeted civilians, particularly in Shiite areas of Baghdad, with waves of coordinated car bombings and other deadly attacks. The attacks continued Tuesday when a suicide bomber rammed his explosives-laden truck into a police station in the northern city of Kirkuk, killing two people there and wounding 55, some critically, according to Maj. Raid Emad Rasheed. 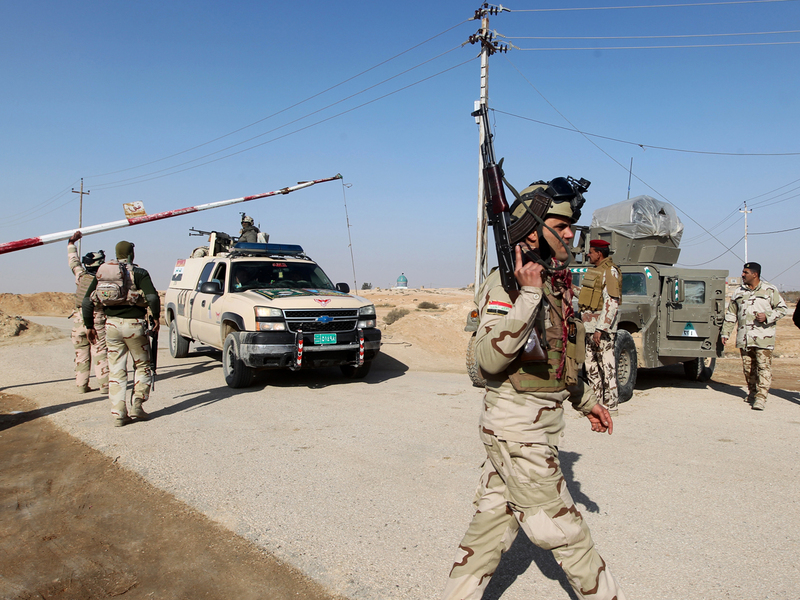 A roadside bomb struck an army patrol southeast of Baghdad, in the Madain area, killing one soldier and wounding another, a police official said. Another bomb hit a patrol of pro-government, Sunni militiamen in Baghdad's southeastern suburb of Jisr Diyala, killing one fighter and wounding four, he added. A medical official confirmed the casualty figures. Both officials spoke on condition of anonymity as they are not authorized to talk to the media. The death toll in 2013 was the highest in Iraq since the worst of the sectarian bloodletting began to subside in 2007, according to United Nations figures. The U.N. said violence killed 8,868 last year.